I learned how to make a chili con queso recipe and loved it. It is a perfect match with a creamy melted cheese blended with chili spices or chili peppers. Like “chili” there are so many different versions. These dishes are generally served as appetizers and are accompanied with tortilla chips. If you are learning how to make a chili con queso recipe, it is known as a Tex Mex recipe meaning that it is a blend of the Mexican cuisine with Texas cuisine. It has become common for the people of the states bordering Mexico to combine the foods in their recipes. Throughout the rest of the United States, these recipes are called Mexican but in actuality they are not from Mexico. Like the chili con queso recipe, chili con carne and fajitas are all part of the Tex Mex recipes. These recipes usually have heavy creamy cheeses, meats and beans from the southern United States. Mexican spices, peppers and tortillas are combined with these ingredients. If you are learning how to make a chili con queso recipe, however you want to categorized these Tex Mex recipes it is up to you. I love the combinations and flavors. I find them very good in appetizers like a recipe for Tex Mex dip skillet dishes, casseroles, a bowl of chili with cheese or even in the cheese stuffed chili peppers. They are all so delicious! In a large heavy pan, brown the ground beef and onion. Add the tomato sauce, tomatoes, beans, corn, green chilies, chili powder and cumin. Bring to a boil, reduce heat to low and simmer for 20 minutes. Stir in the cubed cheese until melted. Ladle into bowls and garnish with sour cream. Cook ground beef in a large skillet. Stir in beans, tomato sauce, taco sauce, chili powder and garlic powder. Heat to boiling, stirring. 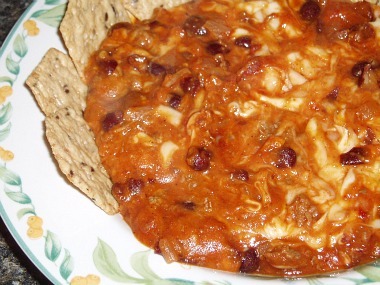 Place tortilla chips in an ungreased casserole baking dish. Top with the beef mixture. Spread with the sour cream. Sprinkle with the green onion, tomato and cheese. Bake uncovered for 20 to 30 minutes or until hot and bubbly. Serve with shredded lettuce, additional taco sauce and tortilla chips. This chili con queso recipe is meatless but has spinach added to the recipe making it a great Tex Mex dip. Preheat oven to 400F degrees; butter 1 quart baking dish. Combine all ingredients and blend well; pour into prepared dish. Bake for 20 to 25 minutes; serve with tortilla chips or toasted pita. MEXICAN DIP RECIPE Although this chili con queso recipe is called a Mexican dip recipe, it is more of the Tex Mex version with the beef, beans and cheese. Cook beef until brown over medium heat in large skillet; drain. Stir in mustard, chili powder, onion, pepper, beans, tomato sauce and taco seasoning. Heat mixture to boiling stirring occasionally. Spread beef mixture in ungreased pie plate; sprinkle with shredded Cheddar cheese. Place in preheated oven at 350F degrees until cheese melts. Serve topped with sour cream topping and tortilla chips. Combine 1 cup sour cream, 2 tablespoons shredded Cheddar cheese and ¼ teaspoon chili powder. Spoon on top of hot dip.